This holiday season, 3 childhood friends become 3 wise men and have the ultimate last Christmas night out in the first red band trailer for Sony Pictures' comedy The Night Before. 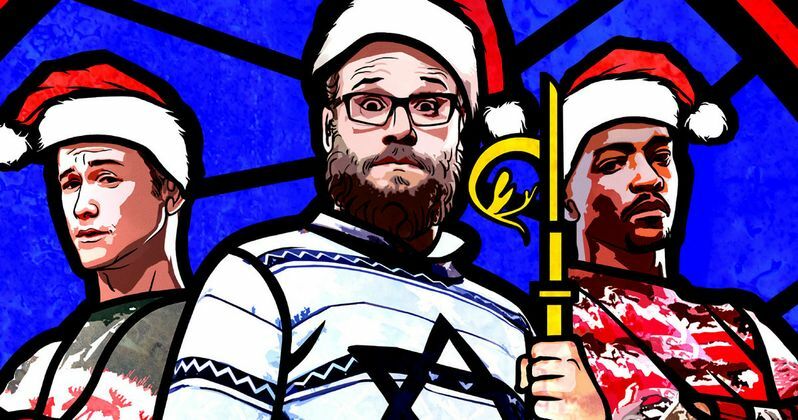 The first footage also includes a reference to Seth Rogen's controversial comedy The Interview, with the trailer stating, "From the guys who brought you Neighbors, This Is the End, and ALMOST The Interview..." Seth Rogen is joined by Joseph Gordon-Levitt and Anthony Mackie in this unconventional holiday comedy. From Jonathan Levine, the acclaimed director of 50/50, comes the new comedy The Night Before. Ethan (Joseph Gordon-Levitt), Isaac (Seth Rogen) and Chris (Anthony Mackie) have been friends since childhood, and for a decade, their yearly Christmas Eve reunion has been an annual night of debauchery and hilarity. Now that they're entering adulthood, the tradition is coming to an end, and to make it as memorable as possible, they set out to find the Nutcracka Ball - the Holy Grail of Christmas parties. Lizzy Caplan, Jillian Bell and Lorraine Toussaint round out the supporting cast of this comedy movie, which is slated for release on November 25. The movie will face some stiff competition on Thanksgiving weekend, opening alongside Warner Bros.' Creed and Midnight Special, Pixar's The Good Dinosaur and 20th Century Fox's Victor Frankenstein. Since it is the only comedy in the bunch, The Night Before should fare well, but we'll have to wait until Thanksgiving weekend to find out for sure. Jonathan Levine, who directed both Seth Rogen and Joseph Gordon-Levitt in 50/50, directs The Night Before from a script by Seth Rogen, Evan Goldberg, Kyle Hunter & Ariel Shaffir. Seth Rogen, Evan Goldberg and James Weaver are also producing through their Point Grey Productions company. Sony Pictures set the November 25 release date last October, before production had even started on this new comedy. In addition to the red band trailer, we also have the new poster, showing this trio of stars wearing some of the most ridiculous holiday sweaters one can imagine. Do you think this holiday comedy has a shot of breaking the bank at the box office? Or will it be drowned out by the other high-profile movies hitting theaters on November 25? Check out the trailer and poster, and chime in with your thoughts below.